Some comforts are obvious: chocolate, warmth after a cold day spent outdoors, the presence of a docile cat. And then others are less easy to understand – these tend to be the ones that people are remembered for: the film ‘It’s a Wonderful Life’, Ben & Jerry’s ice cream and Simon and Garfunkel. And in Denmark, you can add the TV series ‘Matador’ to this list. First aired by DR1 between 1978 and 1982, it has been screened on Danish television seven times – the last showing was in 2012. Earlier that year, a poll revealed that nearly two million Danes – approximately 40 percent of the nation – would happily watch it again. And indeed, an amazing 3.6 million viewers tuned into the airing of the series finale in 1985, a record for a country that only had a population of 5 million at time, which is all the more remarkable given that this was a repeat screening. So what’s all the fuss about? First of all, it’s an incredible concoction of artists producing possibly their finest ever work. Matador is forever associated with its director Erik Balling, a giant of Danish film and television, who besides Matador is best known for making the 1956 Oscar-nominated film ‘Qivitoq’ and creating and directing ‘The Olsen Gang’ series. But the brains behind the series was Lise Nørgaard, the creator and co-writer. Nørgaard, who is now 98, is a cherished Danish journalist, author and screenwriter whom had previously created and written ‘Huset på Christianshavn’ (1973-1977), another hugely popular TV series, which was also directed by Balling. And don’t forget the cast. Over its 24 episode-run, the majority of Denmark’s well-known theatre and cinema actors of the era appeared in the series – in most cases, in what turned out to be career-defining roles. Likewise, the Matador music composed by Bent Fabricius-Bjerre, the creator of memorable tunes like ‘Alley Cats’ and ‘The Olsen Band’, is iconic. And then there is the overriding theme: snobbery. Matador is set in the fictional town of Korsbæk between 1929 and 1947. The story is set in motion by the arrival of Mads Skjern and his young son, Daniel. Mads, undeterred but not unhurt by the less than warm welcome he receives from the established families in Korsbæk, persists with his ambition to open a clothing shop. 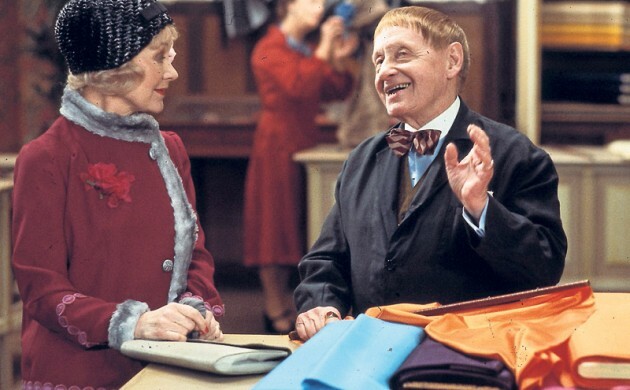 The ‘head of the town’, the banker Hans Christian Varnæs, mistakenly remains loyal to the inept local clothing shop owner, rather than following his common business sense, and refuses to lend Mads any money. Using family money, Mads opens a rival shop, and as the series progresses, he gradually takes over the town. The series is extremely humourous, extracting comic gold from characters who represent every social step of the ladder, and their moves up and down this ladder. One of the many memorable lines from the series is ‘av min arm’ (literally translated as ‘my arm hurts’), which is the Varnæs’s nurse’s only response to any information she receives. When Maude Varnæs complains that her youngest daughter is very slow at learning to speak, her sister wryly remarks: “She is very good at saying ‘av min arm’.” This is a classic example of how the authors manage to subtly and humorously show that the daughter is neglected by her parents and the result is an obvious lack of speech. The time period is also crucial. Matador is set during a pivotal moment in Danish history that many of the original viewers could still remember clearly. The lengthy Nazi occupation, in particular, is enormously interesting to viewers. The series pays faithful attention to the development of fashion, interior design, and cultural trends, and it provides a great introduction to the everyday life of Danes during the 1930s and 40s. This may help explain why every fourth grown-up in Denmark has watched the series at least four times. To a non-Danish audience, however, the response is often subdued. Many give up after the first couple of episodes (normally a present from a new Danish relative) because they find it, at first glance, provincial (it is set in a town) and predictable. But in reality, many fans agree that it is the characters’ unexpected actions that make the series so endearing – in short, the characters behave like real people not caricatures. For example, Maude Varnæs, the wife of the chief executive Hans Christian Varnæs, in one of Matador’s most compelling episodes, surprises everyone by taking responsibility in the face of very real danger to do the right thing. Up until that moment, her solution to most difficulties, small as they may be, has been to announce: “I will go and have a lie down.” But upon hearing the news that the Nazis are going to deport the Jewish population, she drives one of her husband’s Jewish bank assistants to a member of the Danish resistance. It’s an unexpected act of bravery by an unintentionally amusing character, who we had assumed was not at all brave. Matador will no doubt be on again soon. Like good wines, it matures with age.